Direct Diode Laser technology allows Metal Design Systems higher throughput with near-perfect edge quality while also allowing the company to expand their capabilities and increase their opportunities. The Architecture, Engineering and Construction (AEC) industry’s projects range from simple joints that connect the ground to the foundation to incredibly complex as skyscrapers with over 40 floors. From designing ideas to going vertical, the AEC is responsible for the structural environment we live in. These projects start with project development, estimating and discovering funding. It then moves to the pre-design phase, where the program is verified and architects are appointed. Following that, schematics are created, estimated, scheduled and sent out to bidders. Once the project is awarded, the construction phase begins. Fabricators will then start the process of building the design elements that architects have virtually created. Fabricators bring the architects’ digital ideas to life. Bringing order to the chaos is Metal Design Systems Inc.’s (MDSI) solution to their part of the construction process. By compiling project information, schedules and data MDSI manages and manufactures each project seamlessly. 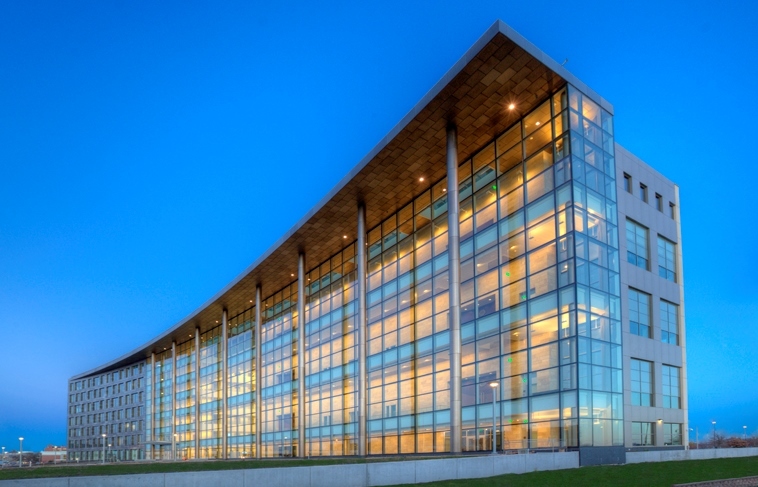 Based out of Cedar Rapids, Iowa, MDSI is a national specialty metal fabricator for the architectural sector focusing on wall cladding, column covers, canopies and other custom products. Advanced technology is empowering leaders to improve and accelerate environmental sustainability throughout the supply chain. MDSI takes on environmentally responsible with a conscientious approach throughout the manufacturing process. “Our facility recycles 100 percent paper, cardboard, wood scrap, 90 percent scrap and 83 percent metal scrap,” explains Dave Untiedt, Chief Operating Officer at Metal Design Systems Inc. But recycling is not MDSI’s only innovative and sustainable move. Continuously incorporating new methodology into their systems, MDSI works to add innovative features and installation improvement. 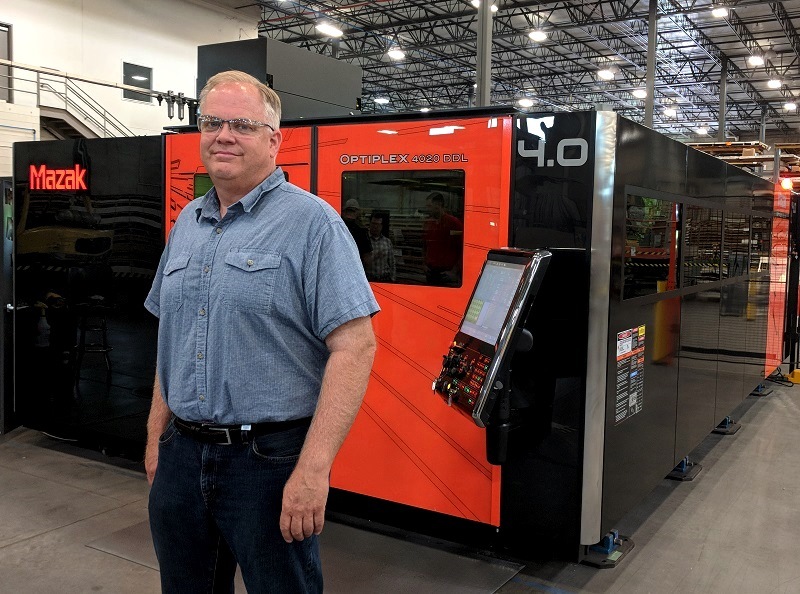 One of their most recent additions was the purchase of a Mazak OPTIPLEX 4020 DDL laser cutting-machine. “Adding the direct diode laser cutting machine absolutely helps us improve and innovate jobs. We can now aggressively chase projects that may not have fit our capabilities. With this additional machine we have expanded our capabilities,” states Untiedt. Previously, MDSI was outsourcing aluminum plate, stainless steel, copper and zinc. However, scheduling issues occurred and there were additional freight costs that required the projects to fit their vision for success. MDSI also has a router table which covered some of their cutting but it just wasn’t enough. With pressure to complete projects faster, have a flawless finished look, and expand their material offerings, MDSI knew a change was needed. “In the architectural metal business, architects like to use various types of metals. We needed something that could support and fabricate anything that the architectural world could imagine. The laser’s capabilities can significantly impact both design and material choice,” says Untiedt. Considering options other than a laser was out of the question. 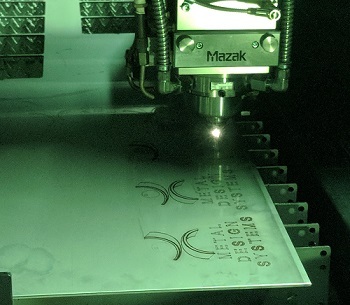 MDSI was looking to expand their capabilities, specifically; to be able efficiently cut materials other than aluminum composite material (ACM) and they knew that a solid-state laser was their solution. Direct diode laser technology not only has speed and energy efficiency advantages, but it also has the edge quality that CO2 lasers offer. This is possible through DDL’s wave length and beam profile. “Edge quality is most important because it provides us the best visual quality without a lot of manual clean up,” states Untiedt, “Because we serve the architectural industry, visual appeal is very important.” The OPTIPLEX DDL was the key to speed and quality. The OPTIPLEX DDL laser-cutting machine has the latest PreviewG Control and drive system with integrated tech tables to simplify operations. 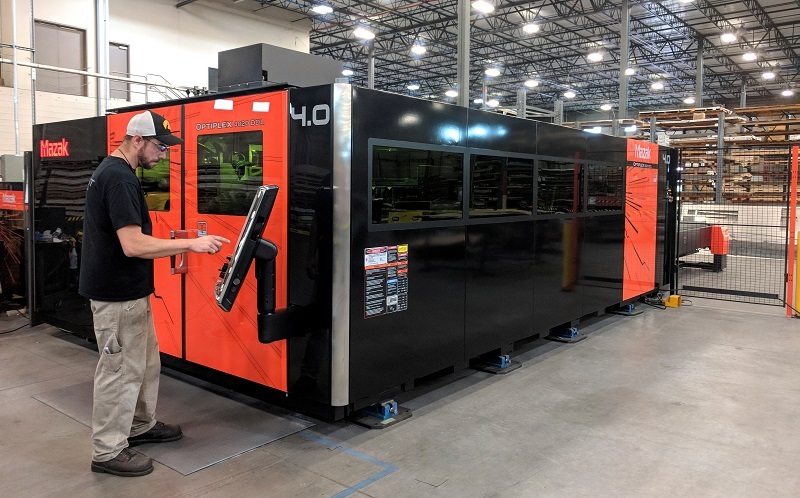 The OPTIPLEX DDL also incorporates Mazak’s intelligent Multi-Control Torch HP-D and Nozzle Changer technology to directly increase the productivity by allowing the machine to optimize the torch setup automatically for each program. This optimization dramatically improves cut speeds, increases throughput and require less operator intervention, delivering more predictable processing day after day. Being different is makes a difference. Direct diode laser-cutting technology is different than fiber and CO2. The combination of wave length and beam profile makes direct diode technology a game changer. The wave length for direct diode can absorb into the metal better which means faster cutting speeds, while the beam profile helps produce cleaner edge quality like CO2. This combination makes DDL technology a breakthrough performance machine. Another aspect of direct diode laser technology is energy efficiency. Direct diode has wall-plug efficiency around 45 percent compared to fiber laser technology. This is because the direct diode power source is more efficient since there is no gain medium that needs to be excited. Direct diode technology utilizes these diodes directly, eliminating the doped fiber system which is used in fiber laser technology. Historically, MDSI has worked with these materials but now with the cutting being in-house, MDSI saves significantly on lead times as well as freight costs. These benefits play a big role in what MDSI provides to their customers; as well as architects and building owners in what they are looking to design. The DDL allows MDSI to produce any custom pattern and or design on architectural façade panels. With this innovative laser technology, MDSI offers the same products but with new capabilities. They still offer column covers, canopies, wall cladding and additional custom products. What changed are the materials available for these products. The ability to use the direct diode laser gives MDSI the ability to process brass, copper, mild steel, stainless steel and zinc. “We at Metal Design System are excited about the capabilities now possible with the Mazak laser. We look forward to assisting our industry in designing a perfect fit,” says Untiedt. Direct diode laser technology has the speed and performance of fiber lasers with the beam shape and edge quality of CO2. This winning combination is heating things up in the industrial laser industry and changing the game for fabricators. This is just the start for Mazak’s direct diode laser technology. Full article seen in the September/October issue of Industrial Laser Solutions.